The emigration of the brothers Gradus Johannes (George) en Lambertus (Albert) van der Kracht to Canada around 1914. Gradus Johannes emigrated to Canada between 1910 and 1914. Through Archivianet: on-line research tool the following data were found which probably relate to him: Kracht George, born 23-04-1890, regimentalnr. 886191, RG 150, Box 5253-67.Also found through the above link:Attestation Paper Canadian over-seas expeditionary Force. This document states that at the time of registration, 14-01-1916, George was married to Mrs. Eybarsan-Kracht and lived at 523 5th st. Price Albert Sask, his profession was bricklayer. In the Netherlands he served in the 8th infantry for 2 years. Place of birth is Ainham, Holland. Lambertus moved to Canada around 1914 after escaping from an internment camp, he lived in Prince Albert for a short while en then probably settled in Stanley Mission, North Saskatchewan as a fur trader. He was married to Angelique Charles, a native woman. With her he became 7 children, they all became several siblings, so there was growing a great Vanderkracht branch in La Ronge with native roots. Through Archivianet: on-line tool the following data were found which probably relate to him: Vanderkracht Albert born: 04-09-1889 regimentalnr: 440520 RG 150,box 9901-42. The year of birth is incorrect, according to BS Oosterbeek this should be 1887. Attestation Paper Canadian over-seas expeditionary Force. This states: Albert Kracht, alias Albert Vander-Kracht, born on 4-9-1887 te Arnheim Holland. This date is correct. At the moment of registration, 23-01-1915 he was single, his profession was bricklayer and he served in the 7th infantry in the Netherlands. He stated his mother, Mrs. Mary Kracht, as relation and gave this address: 320 Batosway st. Arnheim, Holland.. According to Jen’s  information the wife or companion of Albert was a native woman with whom he had children. This information was given by Margaret Sutherland . One of their daughters is probably called Mary, she got in touch with Jen and told her that family members from Holland visited her family and promised to send them as much information as possible about her roots. A promise that was never kept. Some years ago when I visited Facebook I became contact with Mary Johnson  and Lorraine Backer , both granddaughters from Albert. 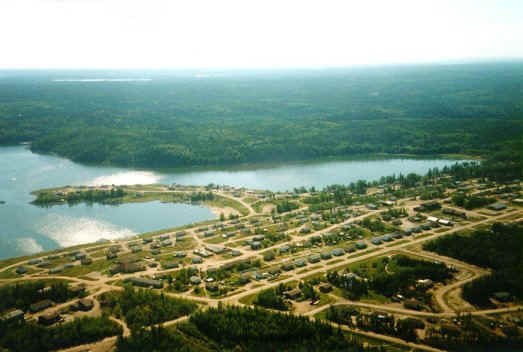 They investigated the La Ronge branch so I could made contact to be a lot of family members in La Ronge, Saskatchewan.